There are two things that enhance and accentuate the taste of bread and are worthy of a home-baked loaf. One is softened butter, preferably with a tiny bit of fleur de sel either in it or sprinkled on it. The other is dukka. This mid-eastern melange of toasted and ground spices and nuts was the most interesting recipe I discovered during my first trip to Adelaide Australia.. It provides one of the simplest yet most pleasing cocktail nibbles. Thick pieces of crusty bread or baguette are dipped first into fruity olive oil which then acts as a magnet for the coarsely powdered blend of spices. Dukkah, which is very popular in the Fleurieu Peninsula of South Australia, actually arrived there via Claudia Roden’s book “A New Book of Middle Eastern Food.” It was made popular by restaurateur Russell Jeavons of Wilunga. The version I am offering is based on his award winning one. 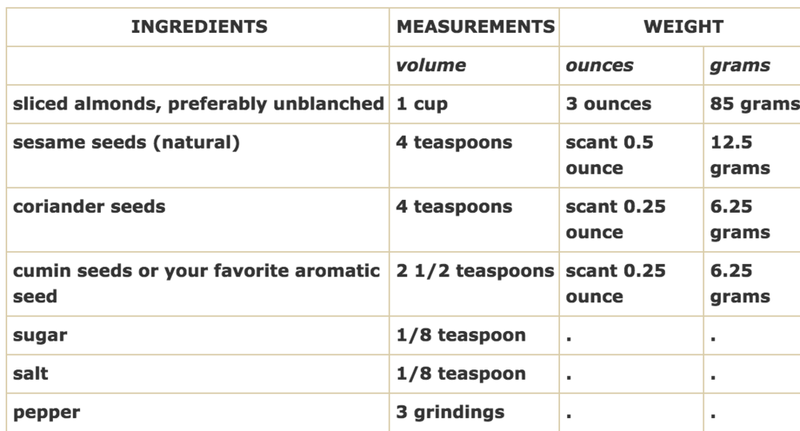 But feel free to take flight from this basic recipe and personalize it according to your own taste with different nuts (pistachio or hazelnuts are a good choice) or a difference blend or balance of spices. That’s what they do down under! At least 20 minutes ahead of baking preheat the oven to 325°F. 1) On a baking pan with low sides, spread out the almonds. Place the sesame seeds, coriander seeds and cumin seeds in 3 separate small custard cups and set them on the pan. 2) Toast the nuts and seeds lightly, just until the almonds begin to color and the spices give off their aromas. The almonds and sesame seeds take 7 to 10 minutes, the coriander seeds 6 to 7 minutes and the cumin seeds about 5 minutes. Remove each of them as they reach this point. 3) Allow the nuts and seeds to cool. 4) In a spice grinder or small food processor, first grind together the coriander and cumin seeds until fine. Then add the sesame seeds and grind them to crush them slightly (about 3 pulses). Then add the almonds and pulse about 8 times until the nuts are in small pieces but not powdered. 4) Place the mixture in a container and whisk in the sugar, salt and pepper. Cover it tightly and allow it to sit for 8 hours to blend the flavors. For longer storage refrigerate for a few weeks or freeze for up to 3 months.